It’s like having a second guardian angel. Imagine having someone, somewhere, who you probably never met praying for you specifically every single day. That’s what most of the priests in the Philadelphia Archdiocese have, and it is hoped every single one of them will too. It’s thanks to a program called Spiritual Motherhood for Priests that began out West and has spread to a number of dioceses across the country. In 2012 Maria Carmel Richardson, director of Family Faith Formation and Parish Services at St. Maria Goretti Parish in Hatfield, wrote to Archbishop Charles Chaput asking for his permission to bring the program to Philadelphia, and he readily gave it his blessing. At the time there were 534 diocesan priests, and the goal was to assign each of them a spiritual mother who would pray for them daily. By January of this year 226 spiritual mothers had made the commitment. Interestingly, while the spiritual mothers know who their spiritual priest-son is, the priests only know they have one but not her name, according to Richardson. The spiritual mothers are also encouraged to send their priest special greeting cards on his birthday and ordination anniversary, and other greeting cards or tokens as they see fit. While the spiritual mother is kept informed of any changes in her priest’s assignments, he is only notified of her identity if she dies, perhaps to attend her funeral as gesture of gratitude. The spiritual mother is also given a special bracelet to remind her of her bond. 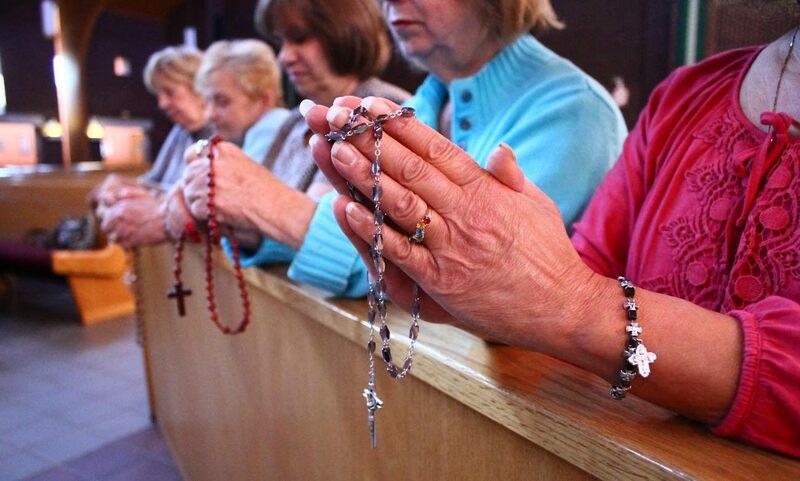 This year has been especially fruitful in enlisting more active Catholic women to participate in prayer for priests. Archbishop Chaput sent all the spiritual mothers a Mother’s Day card and encouraged them each to recruit one more member. One of Richardson’s key committee members, Kathy Popiny, died in March and in her honor a special recruitment drive, Kathy’s Key, was set in motion. So far this year, according to Richardson, an additional 181 spiritual mothers, both lay and religious, were recruited. “We achieved 80 percent of our goal and need 128 more,” she said. Interestingly, Richardson first heard about spiritual motherhood for priests at a spiritual conference in Wildwood, New Jersey, where during a presentation WTMR Catholic radio host Kathleen McCarthy mentioned the program, although she was not herself a member. Richardson not only took up the cause, she persuaded McCarthy to become a spiritual mother too. For more information or to adopt a priest contact Maria Carmel Richardson at marichar@comcast.net or 267-644-2878. To learn more about the program visit the website prayformypriest.org. Standing around a poster of the prayer program for priests are the “spiritual mothers” at St. Maria Goretti Church in Hatfield. 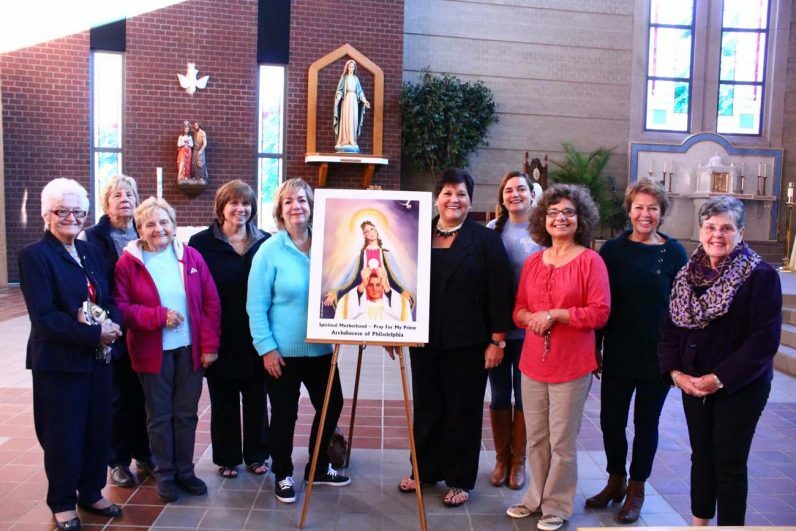 They include Catholic radio host Kathleen McCarthy (center left) and the founder of the local Spiritual Motherhood for Priests program, Maria Carmel Richardson (center right).